A New York City official and champion of people of determination praised the role and innovative approach of the Roads and Transport Authority (RTA) in making Dubai an accessible city. Delivering his keynote address at the 10th Dubai Award for Sustainable Transport (DAST) Victor Calise, commissioner at New York City (NYC) Mayor's Office for People with Disabilities, said he is pleased with RTA's projects in improving access for persons with disabilities and its commitment to making the city roads fully accessible to People of Determination by 2020. "When I previously visited Dubai in 2015 for the Dubai Inclusive Development Forum, I was very impressed with the accessibility features in your education, infrastructure, and particularly in your transportation system," he said. Calise, who sustained a life-changing spinal cord injury in 1994, said RTA's innovative approach to developing tools that will improve the lives of people with disabilities is setting an example for other global cities to follow. He said New York subway stations have the same tactile way finding system of the Dubai Metro for the low-vision people to guide them to doors or their designated locations in the carriages. The lack of infrastructure for people of determination is a global challenge. He said: "As commissioner of the NYC Mayor's Office for People with Disabilities, I am working tirelessly to make New York the most accessible city in the world." alise advises the NYC Mayor on issues affecting over 900,000 New Yorkers with a disability and six million visitors with a disability. He noted that both Dubai and New York are "on the cusp of a new technological revolution that will profoundly change the way people will go about their daily lives." Calise said this will happen because like New York, Dubai is in the forefront of implementing autonomous vehicles on the roads that will not just benefit the environment but more importantly the People of Determination by making mobility inclusive for everyone. 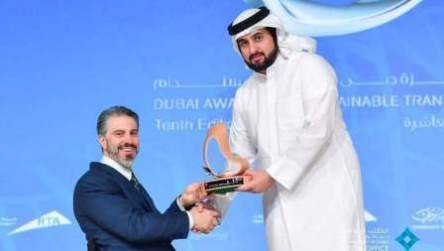 Khaleej Times reporter Angel Tesorero bagged the Best Journalist award at the 10th Dubai Award for Sustainable Transport (DAST) held under the patronage of Sheikh Hamdan bin Mohammed bin Rashid Al Maktoum, Crown Prince of Dubai and Chairman of Dubai Executive Council at the Dubai World Trade Centre on Wednesday. Sheikh Ahmed bin Mohammed bin Rashid Al Maktoum, Chairman of Mohammed bin Rashid Al Maktoum Knowledge Foundation and President of the UAE National Olympic Committee, presented the award to winners of the DAST, which is an initiative by the Roads and Transport Authority aimed at "encouraging community organisations to play an active role in supporting sustainable transport and protecting the environment." "DAST is a practical manifestation of RTA's strategy geared towards enhancing its vision of providing 'Safe and Smooth Transport for All' in keeping with the current upswing seen by Dubai spanning business, economic, tourist and real estate sectors among others," said Mattar Al Tayer, RTA director general and chairman of the Board of Executive Directors. The Best Journalist award is given to a member of the UAE media who has made the best media coverage of sustainable transport nationwide.